Save money and time with the Online Washington LLC formation application. Our easy-to-use service helps you form your LLC directly online without the costly attorney fees. Pick a package, complete a comprehensive interview online, follow our step-by-step instructions, and leave the rest to us. We file your certificate of formation with the Washington Secretary of State for you and your LLC will come into existence the day they're filed. If you'd like to form an LLC in a state other than Washington, click here to select your state. 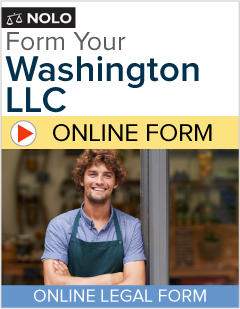 Form your Washington LLC today! Create your LLC without any of the legal hassles. It's simple, comprehensive and we do the hard work for you! For over 35 years Nolo has been publishing affordable, plain English books, forms and software on a wide range of legal and business issues, including estate planning, small business, personal finance, housing, divorce and intellectual property. Everything we publish is regularly revised and improved by our staff of lawyer-editors, to make sure that it's the best it can be. We pay close attention to changes in the law and we'll make sure your online legal documents stay legally up to date. Please note We believe accurate, plain-English legal information should help you solve many of your own legal problems. But it's not a substitute for personalized advice from a knowledgeable lawyer. If you want the help of a trained professional-- and we'll always point out situations in which we think that's a good idea-- consult an attorney licensed to practice in your state. How many people do I need to form an LLC? How do I form a Washington LLC? How much will it cost to form my Washington LLC? How long will it take to form my Washington LLC? How long do I have to work on my LLC formation? Will I have to pay taxes on my Washington LLC? Do I need a lawyer to form an LLC in Washington? Can I form an LLC in a different state than the one in which my business will operate? Are LLC members subject to self-employment taxes? Do LLC membership interests need to be registered as securities? Does forming an LLC mean I don't need a business license? How can an LLC be ended after it has been formed? What if I want to change the information I gave you for my new LLC? Where can I learn more about LLCs? A limited liability company, commonly called an "LLC," is a business structure that is similar to a corporation, but less formal. Business owners form LLCs to protect themselves from being personally liable for business debts. LLCs combine the pass-through taxation of a partnership or sole proprietorship with the limited liability of a corporation. As in a partnership or sole proprietorship, income "passes through" the LLC to the LLC owners, and the owners report the business's income on their personal income tax returns. Unlike a corporation, the LLC itself is not a separate taxable entity. For these reasons, many people say the LLC combines the best of partnerships and corporations. The decision to form an LLC is an important one. Like a corporation, an LLC is meant to be a permanent legal entity, and it will exist -- and incur taxes and fees, whether or not you are actively operating a business -- until you take legal steps to dissolve it. Note that Nolo's Online Washington LLC service does not allow you to form a series LLC or a nonprofit LLC. To learn more about limited liability companies and whether an LLC is the right structure for your company, visit the Limited Liability Company area of Nolo's website. How many people do I need to form a Washington LLC? You can form a Washington LLC with just one owner. You should consider forming an LLC if you plan to run a business and are concerned about personal exposure to lawsuits or debts arising from your business. For example, if you decide to open a store-front business that deals directly with the public, you may worry that your commercial liability insurance won't fully protect your personal assets from potential slip-and-fall lawsuits or from claims by your suppliers for unpaid bills. Running your business as an LLC may help you sleep better, because it instantly gives you personal protection against these and other potential claims against your business. Corporations also provide this protection from personal liability. Which is better? For many small businesses, the relative simplicity of the LLC makes it the better choice. However, corporate taxation is very different from the taxation of LLCs, and this can be a deciding factor in which type of business you form. For instance, if your business will hold property such as real estate that's likely to increase in value, an LLC may make more sense, because corporations and their shareholders are subject to a double tax (both the corporation and the shareholders are taxed) on the increased value of the property when the property is sold. On the other hand, corporate income tax rates start out low -- 15% -- so having the corporation rather than the owners taxed on some of the income may make sense. Note that not all businesses can operate as LLCs. Businesses in the banking, trust, and insurance industry, for example, are typically prohibited from forming LLCs. For more information on whether an LLC is the right structure for your business, visit the Business Formation area of Nolo's website or read Nolo's book LLC or Corporation? How to Choose the Right Form for Your Business, by attorney Anthony Mancuso (available as a downloadable eBook). Or, if you'd like the advice of a professional, our website features an online lawyer directory as a free resource to our customers. Comprehensive profiles of business attorneys in your state can be found at www.nolo.com. In Washington, you create an LLC by filing a "certificate of formation" with the Secretary of State's office and paying a filing fee. You'll also need an LLC operating agreement, though it doesn't need to be filed with the Secretary of State. Your operating agreement explicitly states the rights and responsibilities of the LLC owners. An operating agreement clarifies the business arrangement between the owners and governs how your LLC will be run. If you don't create a written operating agreement, the LLC laws of your state will govern the inner workings of your LLC. After the certificate of formation filing is accepted by the Secretary of State and you have an operating agreement, your LLC is official, but you will still need to obtain the licenses and permits that all new businesses must have to operate. These may include a business license (sometimes also referred to as a "tax registration certificate"), a federal employer identification number, a seller's permit, or a zoning permit. Forming an LLC does not exempt you from any of these requirements that apply to all businesses. To begin creating your Washington LLC, visit the Online Washington LLC page at the Nolo website. The price of Nolo's Online Washington LLC formation service varies depending on your needs. Nolo's Basic Service. The price starts as low as $99.00 for Nolo's Basic Service, which includes preparation of the certificate of formation, preparation of a customized operating agreement, and standard filing. Processing time takes up to two weeks. Nolo's Express Premiere Service. For all of these items plus Priority Rush Filing, a personalized LLC records book, membership certificates, an LLC seal, and preparation of the IRS application for a tax ID (Form SS-4), choose Nolo's Express Premiere Service for $299.00. With Priority Rush Filing, your LLC will be formed within one business day, and you'll receive your final LLC documents three to four business days later. Note that filing fees charged by the state are not included in our package prices. The Secretary of State charges $200 (this includes an expediting fee). This filing fee will be added to your total when you check out. To compare Nolo's Washington LLC packages, see the package and pricing details. If you order the Basic package, we will file your paperwork with the Washington Secretary of State and send you your completed LLC documents by email within two weeks. If you order the Express Premiere package, we will file your paperwork with the Washington Secretary of State within one business day and you will receive your completed LLC documents by email three to four business days later. You'll receive your LLC records kit directly from the manufacturer. In the unlikely event that the Washington Secretary of State is experiencing problems, these estimated turnaround times may vary. You have 90 days to work on your LLC formation without purchasing it. Every time you work on your LLC formation through Nolo's Online Legal Forms, your answers are automatically saved in the system. Once you complete and pay for your LLC formation, Nolo's Online Legal Forms will store your personal information for one year. Federal taxes. The IRS does not impose taxes on the LLC; LLC income is reported on the members' individual tax returns. State taxes. Visit the Department of Revenue's website at http://dor.wa.gov/content/doingbusiness/ to learn about state business taxes in Washington. You may also find our article on Washington business taxes and LLC filing requirements helpful. Self-employment taxes. LLC members (owners) who are active in the business will probably have to pay self-employment taxes on their share of LLC profits -- just as partners in a partnership do. You can form your own LLC online by using Nolo's Online Washington LLC. We will walk you through the information needed to form an LLC. If you have a complex question, you may want to consult a business lawyer or tax expert. Our website features an online lawyer directory as a free resource to our customers. Comprehensive profiles of business attorneys in your state can be found at www.nolo.com. If you are trying to convert a corporation or partnership into an LLC, you should consult an attorney. There are some legal and tax ramifications to closing down an existing business and starting a new one that are beyond the scope of our service. It helps to avert misunderstandings among the owners over finances and management. It allows you to create your own operating rules rather than being governed by the default rules in your state's LLC laws, which might not be to your benefit. Learn more about operating agreements in the Limited Liability Company section of Nolo's website. You can form an LLC in Washington even if your business will not be located in Washington and/or no LLC members will live there. But you will probably still need to qualify your LLC to do business in your home state -- and this means you'll have to file additional paperwork and pay additional fees. For more information on whether you'll need to qualify to do business in certain states, read Nolo's article Qualifying to Do Business Outside Your State on Nolo's website. Note that if you don't register to do business in another state when required, you won't be able to enforce contracts in that state. Also, be ready for some state tax complications if you form your LLC in a state that's different from the state where all of its members live. For one thing, the LLC members might have to pay personal income taxes in the other state on LLC income. (At best, you might get credit for those taxes in your home state and not have to pay twice. At worst, you might have to pay taxes you wouldn't have had to pay at home.) Other state taxes vary from state to state, and might influence your choice of location for an LLC. An LLC -- like any business -- has to pay franchise taxes, sales and use taxes, other transaction and excise taxes, and employment, property, and transfer taxes. In addition, in most states, you need to maintain a registered agent in the state where you form your LLC. To avoid these hassles, most smaller LLCs that will operate in only one state form their LLC in their home state. For more information, read Nolo's article Where to Form Your LLC. An LLC member who is active in the business -- like a partner in a partnership -- has to pay self-employment taxes on his or her share of LLC profits. You can deduct half of what you pay for self-employment taxes as a business expense. Members in manager-managed LLCs may not have to pay self-employment taxes if they are not active in the business. The self-employment tax situation for LLC members has been a subject of controversy and temporary regulations, and the dust has not yet settled around many of the issues. If you plan to be an inactive member of an LLC and don't plan on paying self-employment taxes, get an opinion from a local tax expert -- preferably one who is willing to argue his or her opinion to IRS officials, if it comes to that. Membership interests in a manager-managed LLC might be classified as securities because nonmanaging members may be investing their money in a business in which they are not actively participating. A security is defined as an investment in a profit-making enterprise by an investor who is not running the company. If a person invests in a business with the expectation of making money from the efforts of others, that person's investment is generally considered a "security" under federal and state law. Conversely, when a person will rely on his or her own efforts to make a profit (that is, he or she will be an active participant in the LLC), that person's ownership interest in the company will not usually be treated as a security. If your LLC's membership interests are considered securities, you must get an exemption from the state and federal securities laws before the initial owners of your LLC invest their money. If you don't qualify for an exemption to the securities laws, you must register the sale of your LLC's ownership interests with the U.S. Securities and Exchange Commission (SEC) and with your state. Fortunately, smaller LLCs usually qualify for securities law exemptions. For example, SEC rules exempt the private sale of securities from registration if all owners reside in one state and all sales are made within the state; this is called the "intrastate offering" exemption. Forming an LLC does not take the place of obtaining a business license, tax registration certificate, or other required business permits. An LLC merely creates an ownership setup that limits the owners' personal liability. For more information on required licenses and permits, see the Licenses & Permits for Your Business area of Nolo's website. Like a corporation, an LLC is meant to be a permanent legal entity, and it will exist -- and incur taxes and fees, whether or not you are actively operating a business -- until you take legal steps to dissolve it. If you decide to discontinue business as an LLC, you must file a certificate of cancellation and possibly a certificate of dissolution with the Secretary of State. For specifics, see the Secretary of State's website at www.secstate.wa.gov/Corps. For general information on closing a business, read the article Closing Your Business: What You Need to Do on Nolo's website. Your certificate of formation will be generated and filed with the Secretary of State. Turnaround times vary according to the package you choose. If you ordered Nolo's Express Premiere Service, your LLC records binder and company seal will be sent to you independently, directly from the manufacturer. As soon as your filing is complete, we will email you your final LLC documents, including your customized operating agreement and instructions on a few more steps you need to take, including holding an initial meeting of your members or managers and sending an initial annual report to the Secretary of State. After completing your purchase, you may no longer go back and change your answers because your order is being processed. You may, however, view your answers by signing in to your Nolo account at www.nolo.com/products/customer/account/login, clicking on My Account, and clicking on Washington LLC. Once we send your documents to the Secretary of State, we cannot refund your state filing fees and other third-party costs, such as courier and delivery services, should you decide to cancel your order. If you have questions, please let us know here. You have 90 days to work on your LLC formation documents without purchasing them. Every time you work on your LLC formation through Nolo's Online Legal Forms, your answers are automatically saved in the system. Nolo's Online Legal Forms will store your personal information for one year after you pay for your LLC formation. To learn more about limited liability companies, visit the Limited Liability Company area of Nolo's website or read Nolo's Quick LLC: All You Need to Know About Limited Liability Companies, by Anthony Mancuso.